Barely nine months after the last industrial strike that grounded nationwide health care delivery with undesirable consequences, the Joint Health Sector Unions (JOHESU) has again given the Federal Government a two-week ultimatum to meet its welfare demands or it embarks on fresh action from January 31. In a letter to Dr. Chris Ngige, the Minister of Labour and Employment, JOHESU said it had decided to embark on this strike after the refusal of the government to address its demand since the suspension of the industrial action by the union since May 30, 2018. JOHESU is specifically demanding for the implementation of the adjusted Consolidated Health Salary Structure (CONHESS), the payment of specialist allowances to deserving health professionals, payment of arrears of the skipping of CONHESS 10, increase of age of health workers from 60 to 65 years and the review of the composition of the Boards of Federal Health Institutions (FHIs). JOHESU members include five registered associations including the SSAUTHRIA, NANNM, NASU, MHWUN and NUAHP, the five of which have formed JOHESU. The national body of health workers, also complained about wrongful application of no work-no pay to its members. Recall the strike action embarked upon by JOHESU members from April 17 to May 30, 2018 was due to Government’s non Implementation of the “Term of Agreement” freely entered into on September 30, 2017. The strike was suspended as an aftermath of the Court action instituted by Incorporated Trustees of Kingdom Human rights Foundation International, after a pronouncement which was made by the court which stated that all parties should maintain “status quo ante” and avoid any action that can jeopardise the peaceful atmosphere required to resolve the issues after the case was referred to Alternative Dispute Resolution (ADR) Centre. However, the body frowned at the Federal Ministry of Health’s institution and application of the principle of “No work – no pay,” to its members noting that it is at variance to the Alternative Dispute Resolution (ADR) Centre peace accord. The letter read; “We were surprised that the Federal Ministry of Health opted to churning our series of circulars among which was the implementation of the “No work – no pay.” The action led to the non-payment of the part of April, 2018 and the whole of May, 2018 salaries to our members. It therefore called for a revocation of the principle of “No work – no pay,” saying, it is responsible for the non-payment of salaries of some of its members. “In the interest of peace, equity and justice, we hereby appeal to you to use your good offices to compel the Federal Ministry of Health to release the withheld salaries to our members,” JOHESU wrote Ngige in May last year. DAILY INDEPENDENT reported that the national body of JOHESU declared the 2018 strike on midnight of Tuesday, April 17, after its efforts to get the Federal Government to meet its demand failed, hence, prompting about 90 per cent of the health workforce, all of whom are members of JOHESU to proceed on the strike actions. The body’s fresh petition to the Federal Government on its resolve to resume its suspended industrial action by Thursday, January 31, 2019, according to its claims is due to indifference from the former to permanently resolve the lingering issues some of which have persisted for over five years. The letter was signed by the leaders of the several unions that make up JOHESU among whom are Biobelemoye Josiah, National President of the Medical and Health Workers Unions (MHWUN); Adeniji A.A, National President, Nigerian Association of Nigerian Nurses and Midwives (NANNM); Dr. B.A. Akintola, President, Senior Staff Association of Universities’ Teaching Hospitals, Research Institutes and Associated Institutions (SSAUTHRIAI) and Akinade M.O., the General Secretary of SSAUTHRIAI. Others are Dr. Obinna Ogbonna, National Secretary, Nigerian Union of Allie Health Professionals (NUAHP); A.O. Obisesan, the General Secretary of NUAHP; Chris Ani and Peters Adeyemi, National President and General Secretary of the Non-Academic Staff Union of Universities and Associated Institutions (NASU), respectively; and Dr. G.C. Okara, the President of Assembly of Health Care Professionals (AHPA). JOHESU is made up of five registered associations, the SSAUTHRIA, NANNM, NASU, MHWUN and NUAHP. The body said that after a critical look at the actions of the CMD/MDs in the misappropriation of funds meant to pay its members arrears and the illegal payment of skipping arrears to Medical Doctors nationwide and condemned it. It said; “We condemn in strong terms, the non-payment of arrears that has spanned for years by the CMDs/MDs of various health institution across the country to members of JOHESU based on court judgment (NICN Abuja). It said the payment of the skipping arrears of its members that had accumulated should be defrayed without further delay. It also condemned the disregard of the directives of the Federal Ministry of Health by the CMDs/MDs on the payment of the illegal skipping arrears, saying it should have attracted sanctions to erring CMDs/MDs before now. “That the letter written by the Director of Hospital Services pointing out the disregard of the directives of the Federal Ministry of Health by the CMDs/MDs on the payment of the illegal skipping arrears is in order and should have actually attracted sanctions to erring CMDs/MDs before now. “Any illegal payment should be recovered from the beneficiaries without delay. JOHESU further enjoined the Minister of Health to commence an agenda of good healthcare practice in the various disciplines in the health sector as this will boost the quest to attain best practices in the health system. The health workers noted with regret that the six weeks strike which commenced on April 17, 2018, paralysed the entire health sector, thus paving way for avoidable deaths of millions of Nigerians. 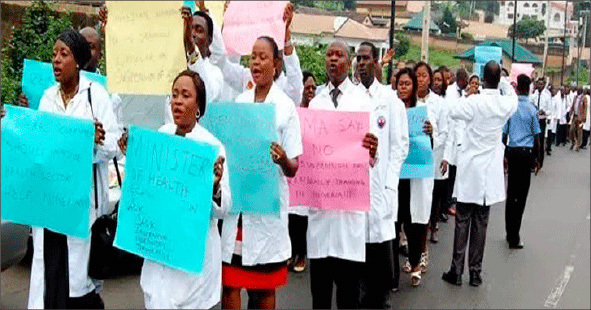 JOHESU stating that it called off the strike in the interest of the innocent Nigerian patients, therefore urged government to pay attention to the demands of its members to avoid fresh catastrophe in the already fragile sector. The letter read; “There is no gain recalling that patients suffered excruciating pains, while their relations suffered untold hardship trying to provide care for their loved ones. All the health institutions at federal, state and local government levels crumbled. The union only suspended the strike to avoid increased casualties of the masses. Worried about similar development in the education sector, JOHESU appealed to the Federal Government to respond to issues that lead to unwarranted strikes in the country to better the lives of its citizenry and usher national development. It lamented; “Incidentally, the same scenario is playing out in the education sector. Our children in the universities had been at home for over four months now and still counting. This has disastrous consequences in the lives of our children and the nation’s education system. “The Federal Government must learn to nip strikes in the bud and not to allow it to fester only to come to a round table when everything has gone amiss. JOHESU had been on this issue since 2014, urging government to improve their lots. We cannot afford to continue to play politics with the precious lives of Nigerian citizens. A stitch in time saves nine.